There are many different ways you can contribute to your community.. volunteer time, send money, join on fund raisers, and such. Pacific Union International has taken a very active role in Children's Miracle Network/Children's Hospital, and the Susan Komen Race for the cure. I've been fortunate when I was growing up.. I was able to attend excellent New York City public and private schools ... practically for free. The Cooper Union For The Advancement of Science And Art.. where it only cost several hundred dollars each year to register. So.. I realized that schools, and libraries, are near and dear to my heart. When we set up the Serkes Living Trust, half of our estate will go Cooper Union, Libraries, and other community organizations. But.. we wanted to do something now.. and that's where we came up with the idea of using our moving van! Here's how you can use it to help us support our local schools! The use of Ira and Carol Serkes’ berkeleyhomes.com 2001 Ford E-350 14 ft. moving van is free to our clients, community and charitable organizations. It’s also available for others... we simply ask that you make a contribution to support our local elementary schools. Are you planning a fund raiser or silent auction? It would be our pleasure to offer the use of our van as an item for auction! We have already donated proceeds from its use to Berkeley’s Thousand Oaks Elementary School within two weeks of getting our vanl! Advance reservations are required and there are some restrictions, such as current drivers’ license, age of driver and local usage, etc. 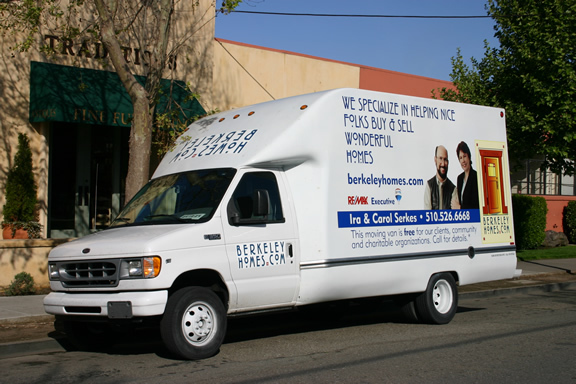 Just give us a call or send an email if you’d like to use the Ira and Carol Serkes berkeleyhomes.com moving van. We’re thrilled to be able to support our local schools!